I bought genuine Honda rear diff. fluid and a pump because I wanted to change it myself. But as I got oil change yesterday at the mechanic, I asked him how much it'll cost for him to do it, just the labor. He mentioned $60 because he has to remove that black box (shown with red arrow) in the pic below. I wonder what that is. Is it a must to remove it? Also want to change the power steering fluid. I watched Youtube videos where they just pumped out the fluid from the reservoir and fill it with fresh fluid multiple times, each time driving a bit. This is similar in concept to changing the ATF where you don't flush the whole system but merely add enough new fluid repeatedly so that it's "mostly" new. I like this approach since it's much easier than flushing. But is it truly adequate for power steering? What about the brake fluid? Can I replace new fluid in the reservoir or is a flush much better for this? I heard one has to be concerned with water and moisture in the brake lines. The black cover DOES need to be removed so that you (or he) can fit a square-drive ratchet in there. I've replaced my PS fluid the way you mention. I used two 12 oz bottles of genuine Honda fluid. I think it is telling that several aftermarket suppliers have created a special 'blend' of PS fluid just for Hondas. Use the right stuff. You cannot just replace the brake fluid in the reservoir, because BF doesn't 'flow' You really need to bleed it properly. A vacuum pump works great, but you still need to pump the brake pedal a bit to purge the fluid in there. I'm going to try to do it this weekend. 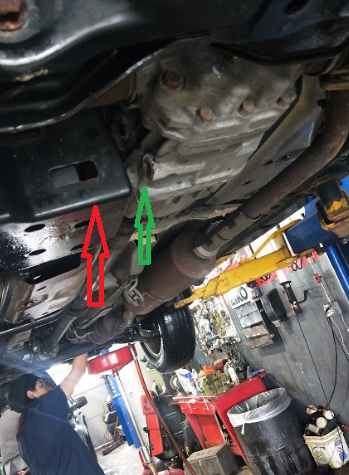 For the 06 CRV, do I need to lift the rear using an oil change ramp or is there enough room down there to crawl underneath and do this? Also, do you remember what size head to use to replace the fill/drain nut for the rear diff.? I really like that I was able to change the ATF myself by crawling underneath. Like the transmission drain, the diff's fill & drain bolts use a 3/8 square drive socket. ALWAYS loosen the fill bolt first. I don't change them every time, but you should have new aluminum crush washers on hand. Might have been mentioned, but a pump that fits to the quart bottles of DP 2 is handy. Otherwise you need a LONG tube stretched out to the left side, with a funnel secured to the open fuel filler door. 1. The mechanics rinsed the pump hose prior to using it and I saw bits of water inside the tube. This means he got bits of water in my rear differential along with the new fluid. Will this cause the innards to rust? I'm thinking about changing it one more time, using my own dry pump next time. 2. The three bolts that holds the black cover was all rusted and broke while it was being disassembled. The mechanic ended up using cable tie to put back the black cover. He said it covers the 'charcoal filter'. I wonder if I can just get rid of the cover? That's some "Mechanic" you picked. Sounds like he had Brain Damage or sniifing too much Gas. Get that water our of your differential. 2.Get those Bolts out and reattach the black cover properly. Maybe visit a Honda Shop. Yeah, going to change it twice again. But I wonder if it's even possible to get that water (grant it was just a tiny bit of droplets in the tube he used) out by just draining since water is probably heavier than the fluid and will likely stay at the bottom of the case which is lower than the drain hole. You are not screwed. The Diff fluid is now clean and you shouldn’t worry about it anymore. You should not leave the cover off of the charcoal canister. The proper way to repair that is to either drill out the broken bolt or use an easy out so that a new one can be inserted. The fact if using water to rinse the tube, that was just laziness. Use brake cleaner or similar. As for the few drops, if you change the fluid again right after driving it you'll be ok.
As for the zip ties on the cover, sh** happens. Not the mechanics fault things we're rusted in place and snapped off. Unless you were going to pay him to fix it properly (if possible, easy outs definitely not an option here and drilling out may not be) at least he put it back in. No mechanic is going to fix those bolts for what they are getting paid to change rear differential fluid. Anyone who expects it needs to pull their head out of their a$$. Have nothing to do with mechanical competency, has everything to do with not having the work done at proper intervals so the bolts we're being removed and such before they got that bad. And Zip Ties work just fine for hold plastic covers back in place. Don't you guys think that a couple of drops of water in the diffy fluid will shortly evaporate out of the fluid. Perhaps in a week or two. Just guessing that a few drops of water will not require another drain and fill. Is there anything wrong with changing the ATF/Rear Diff Fluid more than recommended? Changing ATF and Diff fluid. Acura stuff the same? 2002 CRV. how to do brake and power steering fluid change? '99 rear diff fluid change - fluid type?